US President Donald Trump has given himself six months to pull off a venture which has burned a record number of aspiring Middle East peacemakers, high and low. He has made September 2017 his deadline for convening an American-Arab-Israeli conference to formalize a Middle East peace pact bearing his name. A frenetic surge of diplomacy is underway with envoys and messages flying back and forth, both openly and through back channels, among the lead players, the US, Egypt, Saudi Arabia, the United Arab Emirates, Kuwait and Bahrain, as well as Israel and the Palestinians. The process gained initial momentum from the concessions offered by Israel. Most are outlined in Prime Minister Binyamin Netanyahu’s “Economic Peace” program for raising Palestinian living standards and stabilizing the Palestinian Authority in Ramallah – both before and after a negotiated peace. It includes such steps as developing infrastructure and industry in Palestinian-ruled areas of the West Bank and Gaza Strip, with the US, Abu Dhabi and Saudi Arabia expected to foot most of the bill. More Israeli jobs will also be made available for Palestinians on top of the estimated 200,000 already employed. 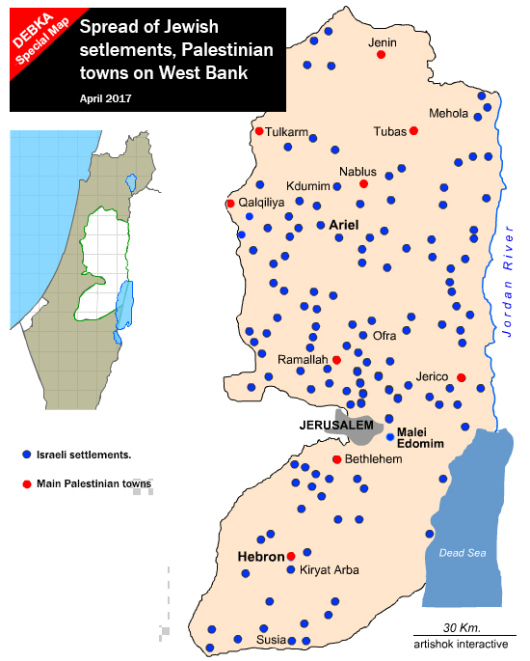 Permits are much sought after, since jobs in Israel pay more than double the average wage on the West Bank. Netanyahu also put his political weight behind the Trump initiative (under the euphemism “coordination”), when he informed the security cabinet on March 30 that the settlement to go up near Nablus – as per his promise to the evacuees of Amona – would be the last one built on the West Bank. All new settlement construction would henceforth be kept within the boundaries of existing Jewish communities in Judea and Samaria and not allowed to spill out of current built-up lines. The Prime Minister added an assurance that Israel had made no binding commitments in advance of final-status negotiations. A new term was added to the dictionary of the Israeli-Palestinian conflict: The “built-up line” is about to run over the historic, albeit ephemeral, 1949 armistice lines and 1967 lines. Last week’s Arab League summit notably omitted for the first time any reference to Israeli borders and so opened a door to the process going forward for normalizing relations with the Jewish state. The new term translates in territorial terms to Netanyahu’s willingness to reach a deal that keeps 10 percent of Judea and Samaria for Israel and cedes the rest for an independent Palestinian state, under the two-state solution of the dispute – a move that may yet rock his cabinet coalition. The proposed solution would limit the jurisdiction of Palestinian security and intelligence services to domestic security and law and order, and assign Jordan to safeguard the demilitarized Palestinian state’s external security. The Egyptian armed forces and intelligence would undertake the same function for the Gaza Strip. The territory retained by Israel will be annexed and come under full Israeli sovereignty. Jerusalem has for centuries defeated all attempts at accords. The current peacemakers have not surprisingly put off raising it with the parties. Ideas are nevertheless being tossed back and forth. The heaviest weight has been thrown behind leaving most of the city under Israeli sovereignty, except for two corridors already used in practice to connect the Palestinian neighborhoods to Ramallah. The southern corridor runs through the Palestinian village of Abu Dis; the northern corridor leads to Al Aqsa on Temple Mount via the Palestinian districts of East Jerusalem including Shuafat and the Mount of Olives. All these plans are still in the ideas stage. They will be thrashed out in the coming months among the concerned parties. Such incendiary issues as Temple Mount, the Christian Holy Places and the Mount of Olives are still wide open. International jurisdiction is a non-option for all practical purposes, after being easily swept away each time it was tested in the Middle East. The nascent peace process is making its mark on steps on the ground – some positive; others avoided for their negative impact. Worth mentioning here is an Israeli plan for a new railway to link Haifa port with Arab countries via the West Bank and Jordan, which Transport Minister Israel Katz unveiled Wednesday, April 5. He sketched the route as running through Irbid in northern Jordan and linking up with the network to Saudi Arabia and on to the Gulf. This new rail link offers them all direct access to the Mediterranean and promises the Palestinian and Jordanian economies an important shot in the arm. Greenblatt promised to enlist Trump’s support for the project. It is now left to the Palestinian leader Mahmoud Abbas to decide if he wants to step into the ring after ducking all the peace initiatives presented him by the last two US presidents and other peace brokers. He gave a positive hint this week with the appointment of his new senior adviser, Husam Zomlot, 43, as unofficial Palestinian ambassador to the United States. Ambitious, qualified and comparatively youthful compared with the jaded Palestinian leadership, Zomlot is a deft networker – not just in Ramallah, but also in the Western corridors of power, where foreign policy is made. The young Zomlot turned his back early on his place of birth, a Gaza Strip refugee camp, and set about climbing the academic ladder. At Birzeit University near Ramallah, he joined the ruling Fatah party and led its campus faction, then moved on to the London School of Economics on a UK government scholarship. He turned in a thesis called: Building a State under Occupation for his doctorate at the University of London’s School of Oriental and African Studies. Abbas has deployed this fresh face to Washington, replacing the veteran Palestinian General Intelligence Director Gen. Majid Fares, in a bid to lift Palestinian interaction with the Trump administration onto a more agreeable plane than hitherto. The new Palestinian envoy was approved by CIA Director Mike Pompeo and presidential envoy Greenblatt when he visited Ramallah last month. By this step, the Palestinian leader hopes for a warm reception when the White House finally sets a date for his visit later this month. He won the invitation with a gesture of good faith by signaling certain Arab rulers that he was finally quitting years of stalling and ready to move forward on an accommodation with Israel. DEBKA Weekly’s Washington sources report that President Trump found Egyptian President Abdel-Fatteh El-Sisi optimistic about the prospects of a positive outcome, when they sat down for the first time at the White House on Monday, April 3. Jordan’s King Abdullah was more skeptical when he arrived in Washington Wednesday.